The Council of Sephardi and Oriental Communities of Jerusalem last week granted the “Medal of the Four Sephardi Synagogues,” to an American professor who researches and publicizes the Jewish past of Zamora, Spain. Prof. Abraham Haim, president of the centuries-old Council said that the medal -- minted by the Israeli Society of Medals and Currency -- recognized the achievements of Prof. Jesús Jambrina in the preservation of the Medieval Jewish quarters of the city of Zamora. It also recognized his work as “organizer of two outstanding international conferences,” in Zamora and Portugal (2013 and 2014). Haim praised Jambrina’s creation of the Isaac Campanton Center to further the study of Zamora’s Jewish history. The center is named for the head of the Zamora yeshiva gedola, (Talmudic academy) now known to be the greatest in the Iberian Peninsula in the last century before the Expulsion. This and other information about the area was known only to a few people, until Jambrina’s groundbreaking conference. Titled “Reencuentro e Historia de la Aljama de Zamora” (“Reencounter and History: The Medieval Jewish Community of Zamora”), it brought together a team of international and local experts in Zamora, in July 2013, to share their knowledge of its Jewish past. “I want to share this recognition with all the people who have made all our programming possible, and especially with the people of Zamora, who have been the majority attending our events. This is an award for them as well,” Jambrina told The Jerusalem Post on November 7. The province of Zamora and the city of the same name is located northwest of Castilla and Leon (close to the border with Portugal), two medieval kingdoms to which Jews fled, escaping the Almoravide and Almohade moorish invasions of the 11th and 12th centuries. Jews were also part of King Fernando I’s repopulation of the region in the mid 11th century. After the Inquisition forced Jews into physical and spiritual hiding between the 15th and 19th centuries, there was scant awareness in Zamora of its Jewish history. On the other hand, since Jews also fled from Zamora to Turkey, Greece, Syria, Israel, North and South America, North Africa and other countries, many Sephardi Jews, internationally, know that their families hail from that Spanish province, or other parts of Spain. Jewish names connected to Zamora are Aboab, Arama, Corcos, De Leon, Saba, Valensi and Habib. An exhilarated Jambrina spoke to the Post after the conference last year. “We’ve done it!” he said. The breakthrough event had united a team of dedicated researchers with a strong connection to the area. 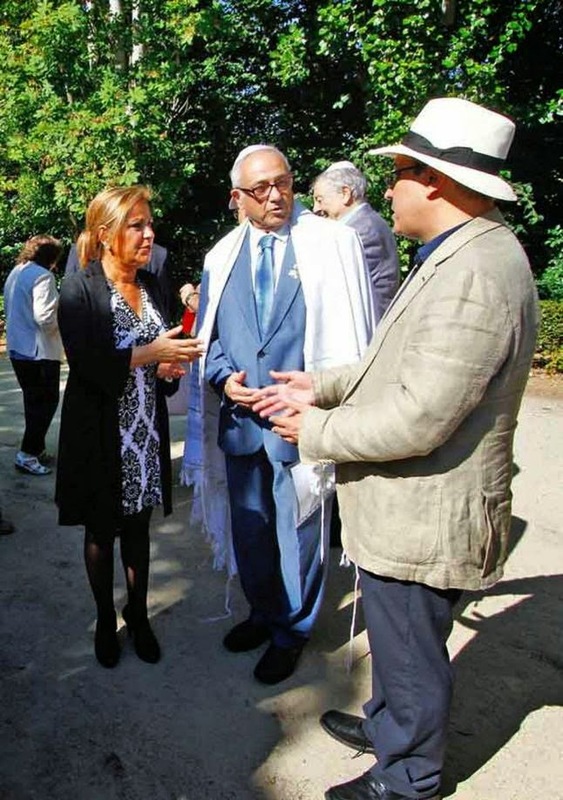 All the members of the conference were invited to the Deputation of Zamora, and Jambrina presented a proposal for marking Jewish sites in the city. Asked about his motivation, he said his interest stemmed from the knowledge that his grandparents, who emigrated to Cuba in the early part of the 20th century, were from the village of Gema del Vino, a 10 minute-drive southeast from Zamora. Jambrina grew up hearing about Zamora and the village and when he began learning Sephardi history, he began delving into Zamora’s Jewish history. Yet when he finally managed to visit the city in 2010, he was puzzled that the places he knew -- by then -- to contain so much Jewish history, were not signposted. The Post attended both conferences and was witness to the excitement of a number of local and international guests whose surnames, family stories and/or traditions, had impulsed them to search for their identity. Talks by well-known experts uncovered historical proof of dangerous border crossings from Spain to Portugal and back; customs from centuries ago still preserved in Spanish families; clues on doorposts, highlighting where a mezuzah should have been; tips on how to recognize a cross made by a converso (forced convert) and more. The much-desired signposting of Zamora’s Medieval Jewish quarters took place in July 2014 at the second conference. True to its promise made at the previous one, the city signposted several places of Jewish. The first to be marked was the Medieval Jewish cemetery. In the presence of Zamora’s dignitaries, members of the public, press and conference attendees, Haim, who presented papers at both conferences, read a prayer for the souls of those who perished and who suffered during the Inquisition. One of these other events was Zamora’s celebration of the first International Ladino Day – the last day of Hannuka -- which last year fell on December 5. In March this year, Haim presented the “Medal of the Four Sephardi Synagogues,” to the former king of Spain, Juan Carlos, at the Zarzuela Palace in Madrid in recognition of the bill passed recently, granting Spanish citizenship to descendants of Jews expelled from Spain in 1492.